WePlay have been working with Aston Villa Football Club since 2016 on a variety of fan engagement and partnership activation projects. Since producing an incredibly successful kit launch campaign with Aston Villa and Under Armour in 2016, WePlay have been appointed by Villa to deliver on several priority briefs. From partnership activations for the likes of FIAT, Greene King and Quickbooks, to building the official Facebook Messenger Bot, BillyBot. The results of our kit launch campaign with Aston Villa and Under Armour were excellent. It generated over 600,000 views, making it the most successful kit launch in the entire English Football League. 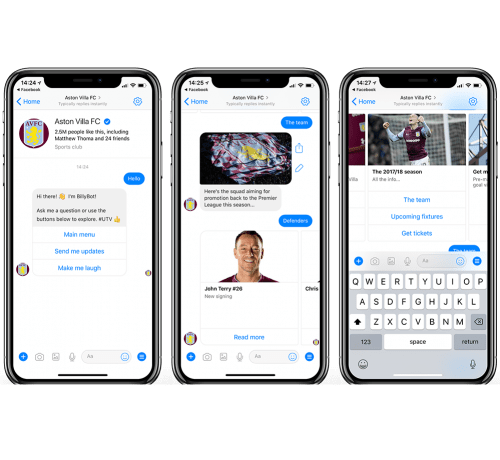 As for BillyBot, it is quite early days but the response from the fans has been excellent and Villa have integrated it as a key channel of their fan engagement strategy. Test out BillyBot yourself here. "To deliver against our vision we engaged WePlay who are specialists in digital engagement within the sport industry and we’re very happy with the result."